Join MOTN President, Rhonda Moniz, along with the students and faculty of Tabor Academy. Rhonda will be speaking about her career in the marine technology and diving industry. Tabor Academy offers students a Marine Science program as part of their curriculum. ​ Rhonda Moniz is the Founder and CEO of UIG. 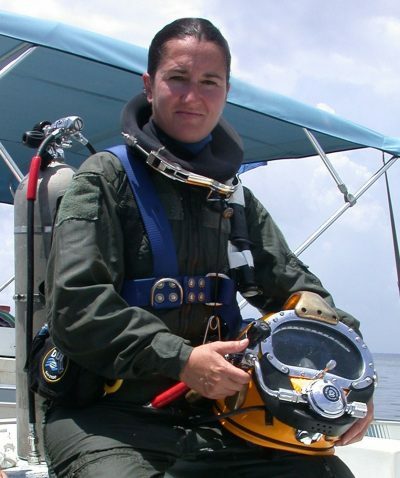 Rhonda is internationally known as a respected Underwater Forensics Specialist and ROV Pilot/Supervisor. Rhonda is also a Dive Instructor and a Diving Safety Officer, and specializes in the use of Marine Technology in Underwater Search and Recovery, and Aquatic Crime Scene Investigation. She has also worked over the past twenty years, as a lead Science Diver, Diving Instructor, stuntwoman, cinematographer, trainer and more with a focus on the marine industry and services. Rhonda been involved in a number of expeditions around the globe including several as the first female ROV Pilot and engineer for Dr. Robert Ballard, who found the Titanic and discovered the presence of hydrothermal vents. In addition, Rhonda works with the US Navy and United States Coast Guard as well as a number of police, fire and homeland security departments. Rhonda is chairman of the board for the New England chapter of the Marine Technology Society as well as President for the Marine Oceanographic Technology Network. She has lectured around the country and is a published author and has acted as a subject matter expert for a number of television productions. Rhonda teaches ROVs and Underwater Forensics at several universities and works with her team to provide UCSI seminars for Police, Fire, and Homeland Security personnel.